Apparently, there is a Hollywood career path that takes an actress from critically acclaimed films of the 1970s to suboptimal suspense thrillers of the 2000s. 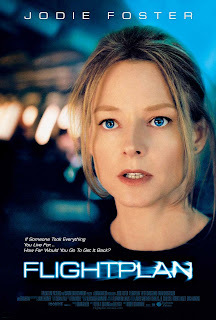 Perhaps inadvertent, that has been the path of Jodie Foster, who began in critical fare like Taxi Driver and The Accused and has ended up in mediocre flicks like Panic Room and 2005's Flightplan, the subject of this post. The set up of the film could have been interesting: In a large, but confined space (in the form of an immense luxury airplane), a grieving widow and her young daughter settle in for a long flight. But shortly thereafter, the daughter vanishes, and no one can verify that the young girl was ever on the plane, or that she was even alive at the time of the flight's departure. Foster, of course, plays the widow, and she spends the first half of the film flailing about the airplane and attempting to convince the crew that she is not without her marbles. The flight's captain (Sean Bean) and air marshal (Peter Sarsgaard) raise eyebrows at her histrionics. In attempting to advance the narrative, Robert Schwentke, the director, lifts some techniques from The Sixth Sense. In the first act of the film, viewers see Foster interacting with her daughter, trekking to the airport, and ultimately boarding the plane. However, the audience never sees the daughter interact with a person other than Foster, suggesting the alleged disappearance may simply be the result of Foster's character's dementia. This, of course, is what the director leads the audience to believe, as there is no objectively verifiable evidence of the daughter's corporeal existence. Is she a ghost? A figment of the protagonist's imagination? Is Foster's character nuts, or is everyone but her character part of a vast airline conspiracy? By the film's ending, the resolution is not interesting enough to justify the initial premise, but that's no surprise. Of course, the "protagonist as crazed loon" angle would have been a cop-out of the first order. However, even that would have been better than the ultimate ending of the film, which degenerates into a B movie complete with a cartoonish villain and lousy action sequences. Really, the first half of the film is an almost workable set up for a psychological thriller, but the second half becomes something akin to cinematic detritus such as 1997's Turbulence. Alas. I sort of suspect the entire script was cooked up when someone wondered what would happen if the person they were flying with never came back from the trip to the bathroom. The movie did start well, the cast was all fairly good, but at some point it all felt a bit crazy. Nobody noticed a kid getting on a plane? Or waiting for the plane? Yeaaaaaahhh.... I dunno.